Ike Peña of Ignacio tested Ryan Daves of Montezuma-Cortez in the semifinals of the Butch Melton Invitational on Saturday. Daves, who pinned Peña in 1 minute, 16 seconds, pinned Bayfields Drake Rhodes in the 138-pound finals en route to earning the best wrestler award for the lower weights. Bayfields Drake Rhodes executed a reversal with 7 seconds left to win his semifinal match against Jose Ocampo of St. Michaels 7-6 on Saturday at the Sun Ute Community Center in Ignacio. Rhodes went on to finish second in the 138-pound division. St. Michaels went on to win the Butch Melton Invitational. 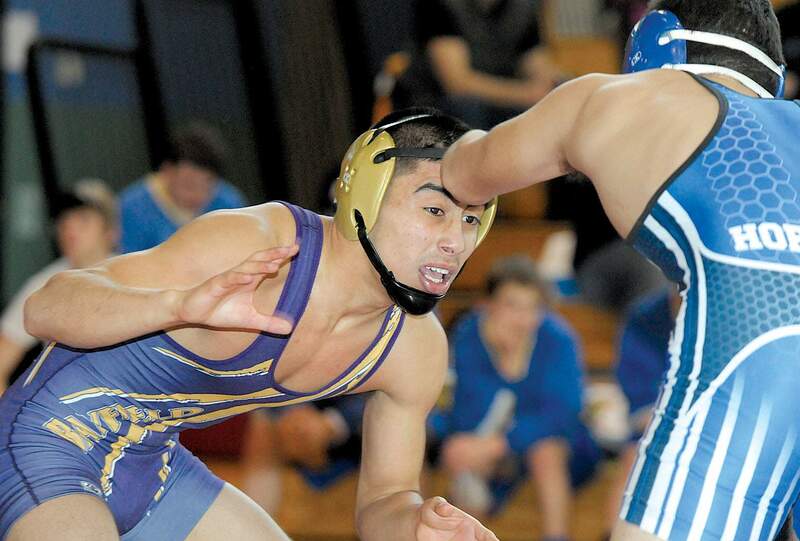 Allec Rodriguez of Bayfield was one of six Wolverines to reach the finals of the Butch Melton Invitational on Saturday in Ignacio. Rodriguez, wrestling at 132 pounds, finished second to Cole Baughman of Dove Creek. Heavyweight Matt Eckstein of Bayfield pinned Tyson Smith of Dove Creek in the second period of their semifinal Saturday. Eckstein went on to finish second, falling in the final to Andes Blea of St. Michaels. 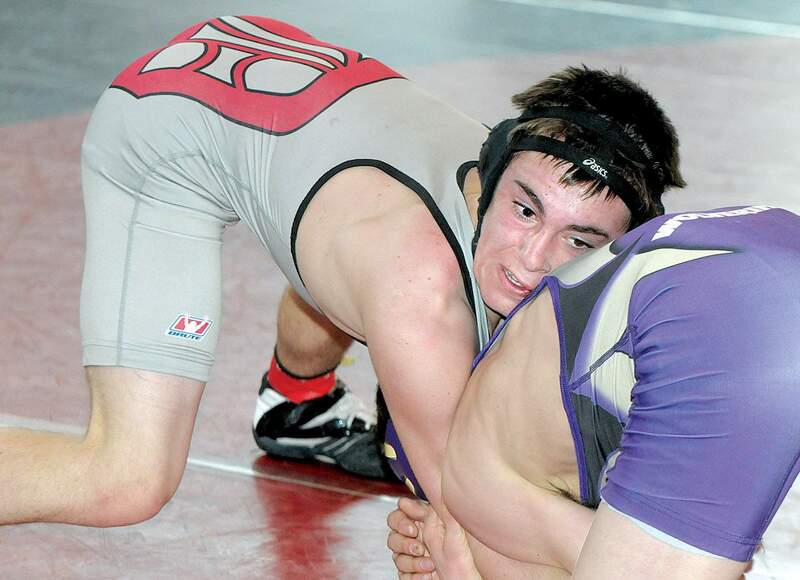 Hunter Hall, one of three Durango varsity wrestlers competing at the Butch Melton Invitational, finished fourth in the 120-pound division at the Sun Ute Community Center in Ignacio. IGNACIO  Whenever the St. Michaels High School wrestling team visits the Sun Ute Community Center, the Horsemen collect hardware  lots of hardware. For the second time in three years, St. Michaels dominated the annual Butch Melton Invitational in Ignacio on Saturday, going home to Santa Fe with the first-place team trophy as well as five individual gold medals. Two years ago, when St. Mikes came up here, they won it, Ignacio head coach and tournament host Bob Overturf said. When they come up here, they wrestle. And we love to have them, Overturf said after watching the New Mexico powerhouse post a staggering 260.5 points to win Saturdays 11-team tournament. Dove Creek, with four individual champions, finished second with 189.5 points. Bayfield, on the strength of six second-place medals, finished third with 167.5 points. Montezuma-Cortez was fourth with 144.5 points behind individual champions Ryan Daves (138) and Trenton Gustafson (182). Daves, undefeated this season at 28-0, was selected the tournaments outstanding wrestler in the lower weight divisions in voting by the coaches. Im just trying to stay on the top side, Daves said after winning three of his four matches Saturday by pin. 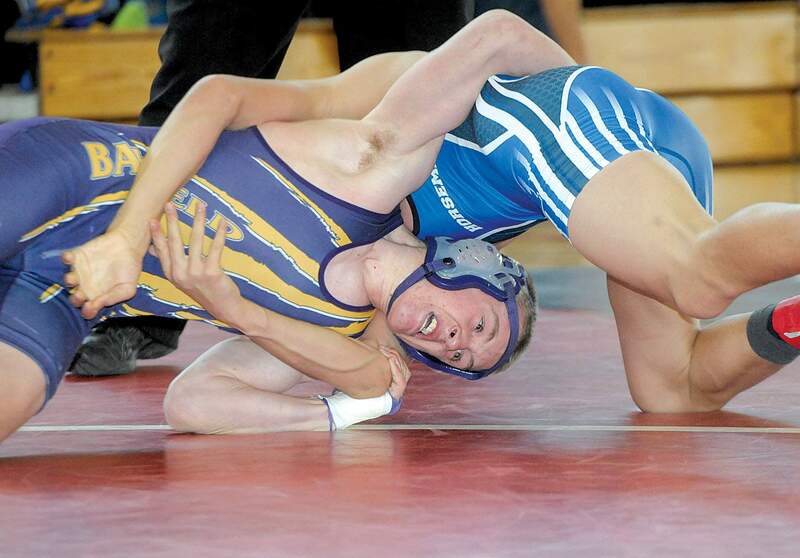 Daves pinned Drake Rhodes of Bayfield in the second period of their 138-pound championship match. Earlier, he pinned Ike Peña of Ignacio in the semifinals. I just work as hard as I can in practice, said Daves, who finished third in the Colorado Class 4A State Wrestling Championships last year. Korey Windham of St. Michaels, who won the 160-pound bracket and was voted the top wrestler in the upper divisions, said a tough practice regimen also helps the Horsemen. We work hard as a team. Our coaches expect a lot out of us, Windham said after his 5-2 decision over Seager Oliver of Cortez in the title bout. Its good to see a different look ... different wrestlers, said Windham, who has lost only once this season. Hes ranked No. 1 in New Mexico at 160 pounds. I just came in with an open mind and tried to wrestle my game, he said. St. Michaels also won titles at 106 (Clayton Montoya), 113 (Geno Palermo), 170 (Luke Sanchez) and heavyweight (Andes Blea). Dove Creek played the family card in winning four titles Saturday: Dalton Randolph was the champion at 152 pounds; Chance Randolph won the 120-pound title. Cole Baughman won at 132; Case Baughman was third at 113. Nick Jones of Dove Creek won at 126, and Wyatt Applin added a second-place medal for the Bulldogs. It was nice getting six into the finals, but it was a tough final round, Bayfield head coach Todd McMenimen said. He was pleased with the Wolverines as they wrestled their way into the championship matches. I felt we approached the final a little bit intimidated, McMenimen said after the Wolverines went 0-6 in finals. Bayfields first opportunity at a gold medal came at 132 pounds. Allec Rodriguez, who had scored a 13-2 major decision over Joseph Jaffa Martinez of St. Michaels in the semifinals, lost to the lanky Cole Baughman of Dove Creek in the championship. Baughman, leading 5-0, pinned Rodriguez early in the second period. Drake Rhodes of the Wolverines powered into the 138-pound final with a dramatic 7-6 decision over Jose Ocamp of St. Michaels in the semifinals. Rhodes, who led early against Ocamp, fell behind 6-5 with 40 seconds left in the match. Rhodes reversal with 7 seconds to go gave him the one-point win and a berth in the championship. But Cortezs Daves relegated Rhodes to a silver medal in the 138-pound championship. Joe Zink of the Wolverines finished second at 145, falling to Wyatt Wade of Dolores by second-period pin. Bayfields Michael Goodman was the runner-up at 182 pounds. He was pinned by Gustafson of Cortez in 52 seconds. At 220, Matt Cerdes of BHS was pinned in the third period by champion Orrin Kennedy of Bloomfield. 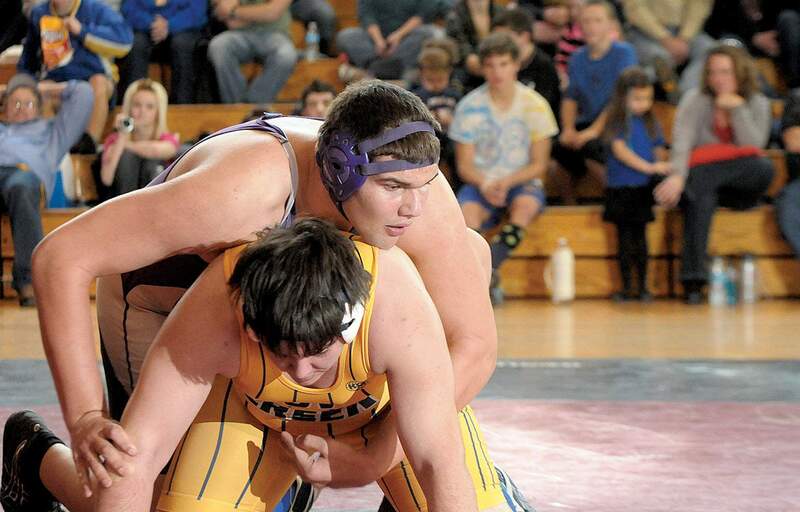 And at heavyweight, Matt Eckstein of Bayfield was pinned by Blea from St. Michaels late in the first period. McMenimen said the Wolverines were solid in Saturdays early rounds. If were going to go out and win matches at state, not just qualify for state, weve got to win these matches, the BHS head coach said. Weve got to be able to beat the good ones, said McMenimen, who also scored a third-place finish with son Colter McMenimen at 126 pounds. Getting six into the finals was fantastic. Now, weve got to make that progression, he said. Durango sent a small squad to Ignacio for Saturdays tournament, led by 113-pounder Matthew Lavengood. Lavengood rolled through two pins in the early rounds before taking on St. Michaels Palermo in the title bout  the only overtime match in the finals. Hunter Hall of Durango added a fourth-place finish at 120. Host Ignacio was led by a trio of fourth-place finishers  Kyle Bailey (126), Peña (138) and Blaine Mickey (170).